It was early afternoon and there was a storm coming on; the sky was dark enough that I’d had to bring Jamie’s reading-globe to my surgery and light a candle in order to see what I was doing. The only way I had of crudely calibrating the dosage of a liquid medication was by estimating the relative color and turbidity of a sample, matched against a set of reference samples that I’d tested on one or another family member, relentlessly questioning them at ten minute intervals through a headache, belly-ache, fever or freshly-bound up wound as a means of estimating the solution’s effectiveness. The main drawback to this method—other than the testy reactions of my subjects—was that I had to make fresh reference samples at least once or twice a month. “Either that, or hit Jamie on the head every Tuesday with a mallet by way of standardization,” I muttered to myself, holding up a vial against the soft clear light that came through the water-filled globe. White willow bark—the best for the purpose [ck availability], brewed up into a tea that ranged from bright gold to a vivid red, to a color that looked like drying blood, if you left it to steep for long enough. And the flavor ranged from a pleasant tang to something that had to be mixed with honey, whisky, or both, in order to be swallowed at all. “Why are ye wanting to hit me on the heid, Sassenach?” Jamie inquired, manifesting himself in the doorway with a silent unexpectedness that made me yelp and hurl my pestle at him in reflex. He caught it, also by reflex. “God knows,” I said, coming to take the pestle from him. “But if you hurt yourself doing it, I need you to try out the latest batch of willow-bark tea.” He’d been hunting for the last two days with Ian and the Beardsley boys, and smelled of blood, animal hair, fresh leaves and his own musk. He made a Scottish noise indicating polite revulsion and bent to kiss me on the forehead. The look of amusement on his face faded. Click here to visit my BEES (Book Nine) webpage, for more excerpts and information. 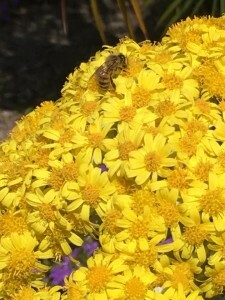 Thanks to Wendy Rauhut for the great bee photo—bees are particularly fond of yellow and white flowers, or so I’m told. This excerpt was also posted on my official Facebook page on June 11, 2018. This webpage was last updated on Tuesday, June 12, 2018, at 12:20 p.m. by Diana’s Webmistress.